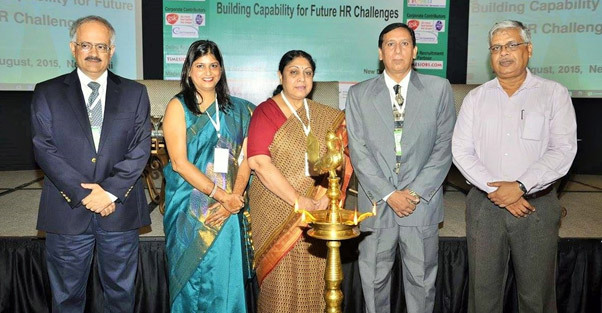 Delhi Management Association in collaboration with Indus Business Academy organized the 7th Mega HR Conclave on the theme “Building Capability for Future HR Challenges” on 20th August, 2015 at The Grand, Vasant Kunj under the leadership of Dr. Veena Swarup, Director –HR, Engineers India Limited as Program Director. The Conclave began with the lighting of the lamp followed by the welcome address & conclave overview by Dr. Veena Swarup. In the Inaugural session Dr. Yasho V. Verma, Board of Director, Dena Bank while delivering his Keynote Address shared the changing business dynamics, shortened life expectancy of the CEO and the key focus now being on the business performance. He laid emphasis on CEO’s role and focused emphasis on the HR challenges in such a scenario. The Chief Guest, Mr. Vipin Sondhi, Managing Director & CEO, JCB India Ltd laid emphasis on excellence in adversity, vision, creating island of excellence and expanding the sphere of influence. He also cited example of Mr. Russi Mody leadership style at the time of adversity and the lessons learnt by him. He further laid emphasis on empowering people in workplace, role of powers that be, becoming job creators rather than job seekers and leadership with humility. Second session was on “Navigating the New HR Landscape” which was moderated by Mr. Ashish Arora, Founder & Managing Director, HR Anexi. Mr. Jacob Jacob, Chief People Officer, Apollo Hospitals, Mr. Kaushik Chakraborty, Director-HR Business Partner & Head of Learning and Development, Jones Lang LaSalle, Mr. Deepayan Sensharma, Vice President-HR, Accenture and Mr. Sandeep Tyagi, Director-HR, Samsung Electronics India were the eminent speakers who shared the role of HR in VUCA times, HR services with focus on user interface in era of data, analytics, cloud etc. Mr. Rajiv Jayaraman, Founder & CEO, KNOLSKAPE was the Session Chairman for the third session on “Gamification & Talent Communities: Role & Significance”. Mr. Ashu Malhotra, CHRO & Director, Jabong.com, Mr. Sandeep Chatterjee, Global Lead-Talent & Organization Practice, Accenture and Mr. Tarun Sinha, Regional Head-BD, Timesjobs.com were the illustrious speakers for the session. The Conclave was followed by Case Study Contest which was introduced for the first time this year. 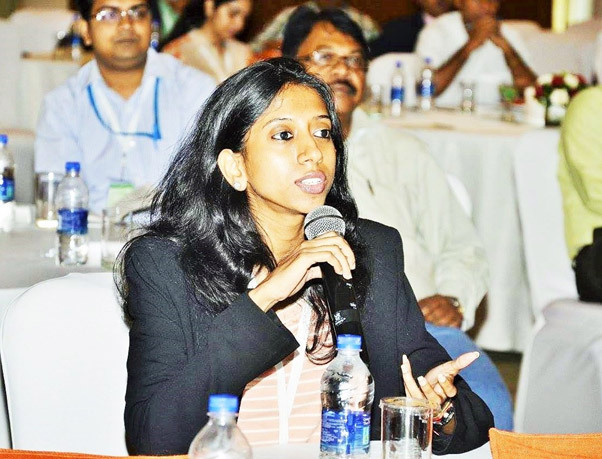 Ms. Megha Sen, HR manager, Octane Marketing Pvt. Ltd.
Wipro Team led by Ms. Jasmine Malhotra & Mr. Praveen Kamath won the First prize, Second prize was received by Engineers India Limited Team led by Ms. Anubha T Agarwal and the Third prize was also won by Engineers India Limited other Team led by Ms. Divya Gupta & Mr. Ashish Katyal. Consolation prize was given to Octane Marketing Pvt. Ltd. Team led by Ms. Megha Sen.
Dr. Ekta Saxena, Program Convener delivered the vote of thanks expressing sheer gratitude to EIL, GAIL, HR Anexi, GSK, Core Competency, PFC, TimesJobs.com, People & Management and Web decorum for supporting the conclave. 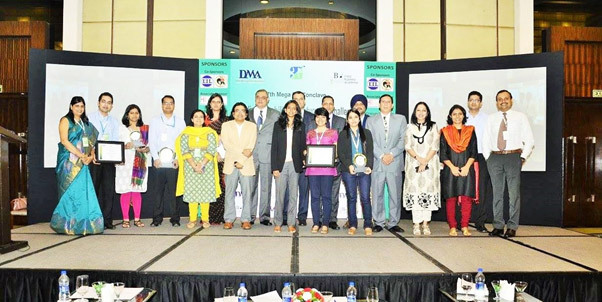 The conclave was attended by “who’s who” of the corporate world and complimented Mr. Rajan Pandhi, Director-DMA and his team for organizing a well conceptualized successful event.